A few weeks ago, many of us witnessed history being made at Trinity Moravian with the consecration of Carol Foltz as the first female bishop in the Southern Province. In her charge, we heard that she pledged herself to the work of children’s ministry in the Moravian Church as one of the important goals in her role as a bishop. The wonderful Logos Choir of children opened the service and warmed many of our hearts with a rendition of “I’ll Fly Away.” It was truly a day to remember. The Board of Cooperative Ministries continues to work for the children in our Province too. The fifth annual Children’s Festival and Lovefeast is almost here. There is a lot of interactive learning of Moravian history planned for families at Hope Moravian. The Moravian Ministry Voyage will happen at Advent Moravian in September. where Moravians of all ages, including children, will gather to learn about Moravian ministry locally and internationally, and see the first ever Southern Province performance of Irene: the Adventure Begins. Irene is a musical about Leonard Dober, David Nitschmann, and their mission work. The Moravian BCM continues to help our congregations in the ongoing ministry with children by providing quality Sunday school curriculum options, Vacation Bible School options, and a whole host of books and resources for families to use in doing faith formation at home. Let’s not forget Carol’s pledge to serve children and our responsibility that we accepted at children’s baptisms. At these baptisms, we pledge to guide them in faith formation in our congregations and we pledge to provide help and support to their parents. The BCM will continue to provide opportunities like the Children’s Festival and the Ministry Voyage. There is a Children and Family Task Force that works under the Board of Cooperative Ministries. It is being redesigned at this time and we are looking for new members. For those who might be interested, it meets quarterly. If you or someone you know has a heart for children and family ministry, please let me know and we would love to have you on our team. The goal of this task force says it all: to celebrate and encourage children and families in the life of our church and support faith communities as we fulfill the promise of baptism for our Moravian families. “Each generation, in its turn, is a link between all that has gone before and all that comes after. That is true genetically and it is equally true in the transmission of identity. Our parents gave us what they were able to give, and we took what we could of it and made it part of ourselves. If we knew our grandparents, and even great-grandparents, we will have taken from them what they could offer us too. All that helped to make us who we are. We in our turn will offer what we can of ourselves to our children and their offspring” (Rogers 65). Whether you are a parent, grandparent, Sunday school teacher, or a member of a congregation, let’s band together and offer the best we can for our children. Beth Hayes is the Director of Congregational Ministries and Resources for the Moravian Board of Cooperative Ministries. She has been working in this role for 33 years. Before coming to the Moravian Church, she served as the director of Christian Education in several Presbyterian Churches. She holds a Master’s Degree in Christian Education from the Presbyterian School of Christian Education. She is a member of Clemmons Moravian Church and regularly attends Come and Worship. Rogers, Fred. The World According to Mr. Rogers: Important Things to Remember. Hachette Books, 2014. The mom, whom I knew only slightly, needed a clergy member. Since she didn’t know any, she had asked our group if we had a name to share, but with this caveat. A reasonable request, maybe – except that the request was being made on the behalf of her son, and the occasion was his wedding. At the risk of seeming judgmental, I indulged in a little disbelief. To Protestant Christians, marriage is a sacred promise; in the Bible, Jesus performs his first miracle at a wedding, turning water into wine at Cana. To have a merely inspirational ceremony seemed, to me, to miss the gravity of the commitment. At this most powerful moment, the young man’s family was choosing to send him off into the next phase of life strengthened by …what? Pivotal life events aside, just on a daily basis, is feeling that there is a power greater than you – but stopping short of calling that power “God” – ok? In going through life’s trials and adversities, is mere spirituality, with its abstract connection to a “higher power,” enough? To explain the program’s “higher power” concept, Insight founder Bob Meehan points in his own writing to C.S. Lewis’s classic Mere Christianity. The book’s first chapter – the first step of Lewis’s larger plan to demonstrate that Christianity is truth – never mentions a Christian God; instead, Lewis first establishes that there is power in the universe greater than humans’, and that the power is good. As a first step in rehabilitating young lives, that belief is all you need, Connors says. “When a person enters the program, that higher power is the love for the person that is expressed by the group. Many of the youth feel disenfranchised from school, friends, family, and religion, even those who grew up in a faith tradition. The group becomes their social and psychological support. “We say, ‘Love within, love without, love in between,’ ‘’ Connors says. There’s the supportive love the group members express for each other. The accepting love of self the program teaches, in order to combat the destructive self-talk to which many of them have succumbed. The outward-turning love for others that allows them to grow. Even if “the greatest of these is love,” seeking the Lord while he may be found gets trickier. Although the group chooses to call the higher power “God,” the individual participants don’t necessarily mean the God they may have grown up with. “When they first come in, they’re at their worst, and so it often stands for “get over death.’ That’s as much as they’ll allow “g.o.d.’ to be,” Connors says. Just as “group of drunks” becomes “grand organizing designer,” so does the participants’ disenfranchisement yield to belief in a power greater than they, and a very Moravian response starts to take place: faith, that their higher power won’t let them down; hope, that they can begin anew; and love for their fellow members and friends. Is spirituality enough? Maybe so, as a foundation upon which a higher power can build. Whether named or implied, God’s presence is palpable. As their walk together unfolds, maybe God’s plan for some lives can be more fully told. What Does it Mean to be Spiritual? Consciousbridge.com. April 9, 2013. Meehan, Bob. Beyond the Yellow Brick Road. Meek Publishing, 2000. Lydian Bernhardt Averitt is a freelance writer and editor, and is the coordinator of the family financial planning certificate program at North Carolina A&T State University. She is an amateur musician and a lifelong Moravian who attends First Moravian Church in Greensboro, NC. Contact her at Lydian@triad.rr.com. The photo that appeared on Laurel Ridge’s page. Photographer unknown. Photo is likely from Senior High Camp, summer of 2016. A lot of ministry leaders and professionals have had their lives impacted positively and their life perspective changed for the better by camp experiences like Laurel Ridge. Read the whole article from the Building Faith website and I think it will cause you to ponder on those spiritual formation experiences in your life. The experiences had a major impact on you, and were truly great… but think a little deeper. Why did they have such an impact? These experiences are also about the important relationships built at camp or vacation bible school. Beth Hayes at the Laurel Ridge labyrinth. Take time, especially this month, as camps begin, to pray for Laurel Ridge. Pray for the campers, staff, volunteers, and ministry that takes place there. Be sure to give the leaders and staff an extra thanks for the positive influence that they have had on your personal faith journey. If you have questions or need additional information, email bhayes@mcsp.org or call the Resource Center (336) 722-8126. Beth Hayes is the Director of Congregational Ministries and Resources, Moravian Board of Cooperative Ministries (BCM). 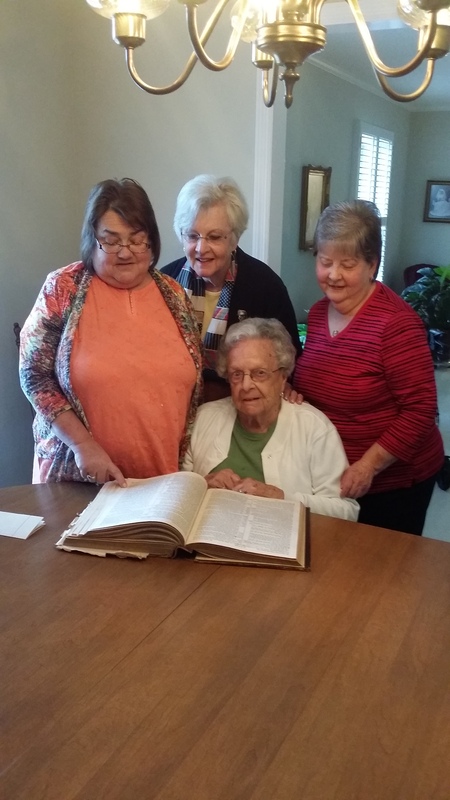 Below, Beth appears with her sister, aunt, and cousin along with the family Bible. I just returned from a symposium in Connecticut done by Lifelong Faith Associates on families at the center of faith formation. It was quite the experience to be in a beautiful fall setting where leaders in churches from different denominations gathered to brainstorm. In our brainstorming, we planed ways for our congregations to celebrate family and help families to be more intentional about faith formation in their homes. More and more I realize that faith formation is not solely a congregational responsibility nor totally a home responsibility, but the two places working together. Faith is formed through relationships. Milestones Ministry brings a cross generational community together to nurture the Christian faith. It is a primary partnership between the ministry of the home and the ministry of the congregation. Each module helps people practice faith with the support of a congregation and in and through ones homes. It honors home as church too. It lifts up daily life relationships, especially parents and other adult mentors. Faith is caught more than it is taught. It models the faith through cross generational experiences and faith practices. If we want Christian children and youth, we need Christian adults around them. There are five steps to generate a specific milestone memory. You need to first name it – identify meaningful, memorable moments. Then you need to equip it – provide faith practices. A blessing comes next as you offer a prayer. It needs a visual reminder… so gift it. The last step is to reinforce it, by following up to firmly root it in faith. Children’s Festival and Lovefeast. August 2016. Photo by Suzy Tucker. About two years ago, the Children and Family task force produced a piece called Moravian Milestones and Stars. We visited every Regional Conference of Churches and gave a notebook to each church to have. Included are age level breakdowns of what Moravians could be expected to know at each age level. The second half of the piece is a resource from Milestones Ministries where specific milestones such as baptism, mission trips, going off to college, empty nesting and many more are described and ways to celebrate these times both in church and in homes. If you have misplaced the notebook or need another copy, all you need to do is ask me for a replacement. I have heard some beautiful stories about how milestone ministries are carried out in specific churches. One congregation adorns their hallways leading to the various classrooms with ribbons for each individual. When a milestone is reached and celebrated, a star is placed on the ribbon. Some churches give a bowl or basket at baptism. For each celebration of a specific milestone, a particular stone with the image of that milestone on one side and scripture on the other is given to put in the bowls. An illustration of the rocks is shown. A friend of many of our educators has covenanted to spend her retirement painting these milestone rocks. If you are interested in the rocks, you may contact me and I will put you in touch with Libby Welter or you may email her at libbywelter[AT]gmail.com and tell her what you are wanting. My next move to encourage our congregations and families is to create some Moravian specific milestones like a first lovefeast, first Easter sunrise service, first Laurel Ridge experience, or first Children’s Festival. You will hear more to come in the next few months as we continue to brainstorm together and create new milestones. Until then, consider beginning this all important ministry in your congregation. You can contact me (Beth Hayes) for help in getting it started. As you continue to see the importance of church and families at home working together, check out the website and Facebook page for Roots and Wings where we will continue to link you to important articles and websites that could be helpful. And remember this passage from Deuteronomy 6:6-7 as the basis for the importance of this ministry. If you have questions or need additional information, email (bhayesATmcsp.org) or call the Resource Center (336) 722-8126.
Who would have thought that the membership of our Southern Province would have declined as it has? Especially since the Moravian Church has so much to offer, including our rich and wonderful history, our special and meaningful traditions, our emphasis on God’s love than on God’s judgment, our value of community, our desire to serve others, and our willingness to accept people with different opinions. Who would have thought that the financial giving from our Southern Province churches to our province would have declined so much these past several years? Certainly part of this is due to our decline in membership. Yet sometimes I wonder how many of us Southern Province Moravians prayerfully consider what God wants us to give and give that amount. How many of us consider God’s guideline of tithing and tithe or try to work toward tithing? How many of us see the importance of giving not only to our church families, but also the importance of how our giving goes to ministries in our province and ministry to the world? Young Adult Moravians (YAMs) at a recent cookout/bonfire event. And who would have thought our province would be at a point when we could not support a person working full-time with the youth and young adults of our province? 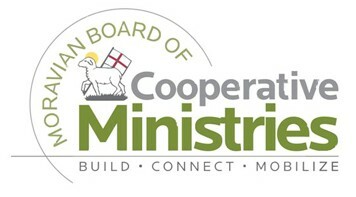 Our Board of Cooperative Ministries shared the recent news of a shortfall in our next year’s budget. I think it is really more of a “big-fall.” Our board had to make the very tough decision that it could no longer support a full-time person to serve as Director of Youth, College and Young Adult Ministries. This decision is my not-so-good news. I am sad I will not be able to continue to serve in a capacity that I have loved these past four years. It has been a joy and a privilege to serve our youth, college age and young adults of the province. Now I look forward to the next step God has for me. But the greater sadness I feel, along with many others, is that of not having someone in this position. 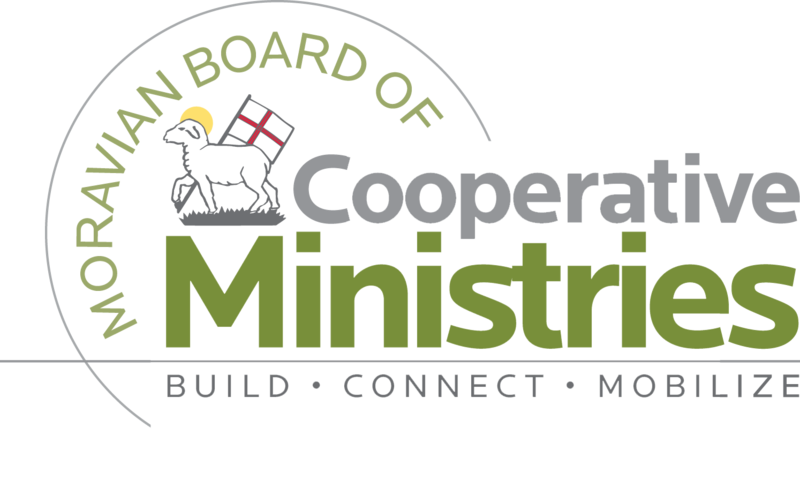 The members and staff of the Board of Cooperative Ministries will do all they can to keep our youth, college, and young adult ministries going. We hope this will also be a time when people will step up and help our youth and young adults feel even more wanted, more loved, and more connected to our churches. My hope and prayer is that the day will come when I can say: Who would have thought that despite the lack of funds and a full-time staff person, our youth, college, and young adult ministries continue to be strong? That these ministries will thrive in even greater ways, and that our youth, college age and young adults will help bring renewal to our churches and our province! Read the original announcement about the discontinuation of the Director of Youth, College, and Young Adult Ministries position here. Read the questions and answers post regarding that announcement here. If you have questions or need additional information, email (drightsATmcsp.org) or call the Moravian Board of Cooperative Ministries at (336) 722-8126. The Rev. 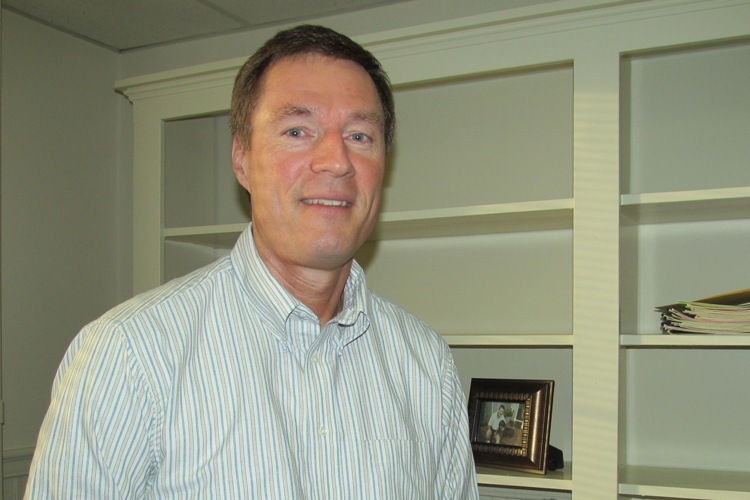 Doug Rights is the Director of Youth, College, and Young Adult Ministries at the Moravian Board of Cooperative Ministries (BCM). A wonderful part about summer in the Southern province is our summer camps at Laurel Ridge, our Moravian Camp and Conference Center. During the summer months we have a variety of camps which include our Mission Camps, an Arts Camp, an Eco Camp, and our Summer Camp. Our Summer Camps are available for those who are Pre-Junior (grades 1-2), Junior (grades 3-5), Middle High (grades 6-8), and Senior High (grades 9-12), and the other camps are for older youth. Besides youth being involved in our camps, we also have several adults in our province who serve as deans and counselors for in the camps. We also have a great group of college students who serve on the M-Staff, the summer staff who maintain the camp grounds and lead various activities. Our camps are wonderful opportunities for all who attend to make connections. There is the connection with nature as you spend time in beautiful Blue Ridge Mountains. There is the connection with other people as you live and share in a community setting. There is the connection with God as you have opportunities to focus on God’s presence, to experience God’s love, and to let God make a difference in your life not only in your time at camp but also as you go from camp to your daily living. One of the great things I saw at one of our recent summer camps was a young person who began the week saying he had never felt God’s love and did not believe in God. By the end of the week I saw how he experienced God’s love through others, and he shared that he was a believer! I will admit that one of the drawbacks of our summer camping program at Laurel Ridge is the distance between our camp in the North Carolina mountains and our churches in Florida. In talking with some of the youth leaders in Florida, we hope that one day we will have more of our Florida youth be able to come and experience God’s blessings at Laurel Ridge. Even so, our camps are going strong, and they do make a difference!